The exo planet 55 Cancri e, a close alien planet, just 40 light-years away from Earth in the constellation Cancer (The Crab), is a super-dense world circles so close to its host star that it takes a mere 18 hours to complete one orbital lap, or some 26 times closer to its parent star than Mercury is to the sun with surface temperatures as high as 4,800 degrees Fahrenheit (about 2,700 degrees Celsius). New observations from NASA's infrared Spitzer Space Telescope have astronomers revisiting the exoplanet, armed with intriguing clues that 55 Cancri e could be a wetter and weirder place than thought. The researchers measured the faint dip in brightness caused by 55 Cancri e passing in front of its star, calculating that 55 Cancri e has a mass 7.8 times that of Earth, and a width just over twice that of our planet. 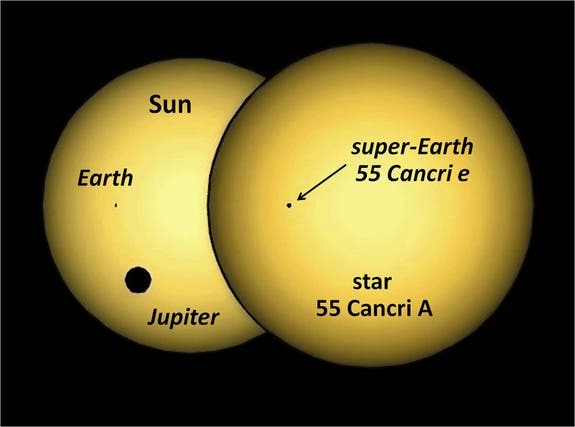 55 Cancri e is part of a multiplanet systemfirst detected in 1997 with five planets circling the host star, which is nearly a twin of the sun.. 55 Cancri e was discovered in 2004. Based on Spitzer's observations, about a fifth of the planet's mass must be made up of light elements and compounds, including water. Since 55 Cancri e experiences such extreme temperatures and high pressure, these elements and compounds likely exist in what is known as a "supercritical" fluid state –liquid-like gases in high pressure and temperature conditions where supercritical fluids could be seeping out from the planet's rocks. "Those properties place 55 Cancri e in the "super-Earth" class of exoplanets, a few dozen of which have been found," wrote astronomer Tony Phillips in a post on Science@NASA. "Only a handful of known super-Earths, however, cross the face of their stars as viewed from our vantage point in the cosmos, so 55 Cancri e is better understood than most." 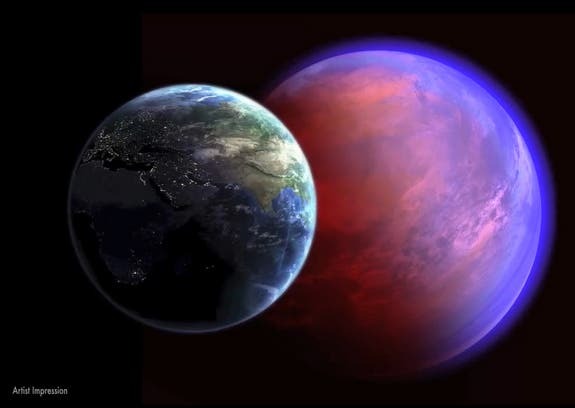 Image at top of page is a NASA artist's impression of the alien planet 55 Cancri e, with Earth in the foreground for comparison. Image below is a simulation of the silhouette of planet 55 Cancri e transiting its parent star, compared to the Earth and Jupiter transiting our sun, as seen from outside the solar system.